Mistley is famous for being the scene of a planned 18th Century salt-water spa development by Paymaster General Richard Rigby who enlisted Robert Adam for some of the designs. Almost all of the Georgian High Street and the Green behind the High Street were to be incorporated into the scheme. These remain virtually intact. However all that survives of the ambitious spa development are the Adam designed twin Mistley Towers of Mistley church and the Swan Basin located opposite The Thorn. The Mistley Thorn predates Rigby’s grand plans having been built in 1723. It stands on the site of an older pub in which Matthew Hopkins, the notorious Witchfinder General tried and condemned to death dozens of local women during the English Civil War. 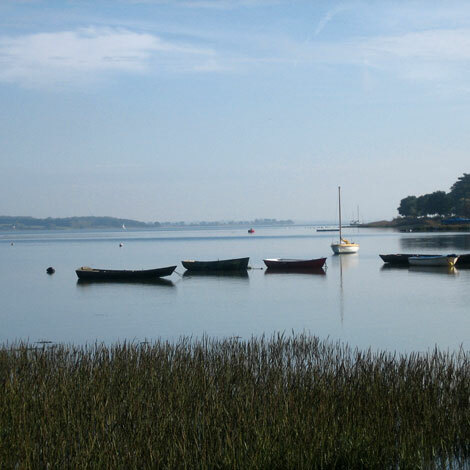 Mistley is also notable for its quay, which has been a trading port for many centuries. From the 18th Century it was the embarkation point for ships and barges taking grain to London. These vessels would return with horse manure used to fertilise the cereal crops – a good example of early recycling. Mistley was also a significant boat-building centre and during the late 18th and early 19th Centuries a dozen men-of-war were constructed including the 914 ton 32 gun Amphibian which was Nelson’s flagship for a time. Later many of the famous Thames barges were built at Mistley, some of whom continue to operate as recreational sailing boats. During the summer they frequently dock at Mistley Quay.